“The formal gardens at Harlaxton Manor were created as an integral feature of the stately home built by Gregory Gregory. In the context of the times, surrounding garden spaces and features provided recreation, a connection to nature, possibilities for social interaction, and an appreciation of moods set by varying types of contrived and natural outdoor spaces. More than 160 years later, the essential purpose of the Gardens remains unchanged. Highlights of the Gardens include French-style terraces, an Italian Garden, a Dutch ornamental canal, and English landscape walks. The Conservatory is virtually unique in design and use of architectural elements. The 6.5 acre walled garden is one of the largest in Britain. The design of the Gardens and its structures are as much a mystery as that of the House. While it is almost certain that Anthony Salvin, Gregory’s first architect, designed the Gatehouse, it is more likely that William Burn, the second architect, designed most of the Garden structures, incorporating Baroque elements similar to those in the House itself. Today the Gardens provide restful outdoor space for residents and visitors alike. Gregory would be most surprised to see the Conservatory in use by faculty and students as a “technology center”—its wireless computer capability beckons many users, while still providing an extraordinary home for plants. 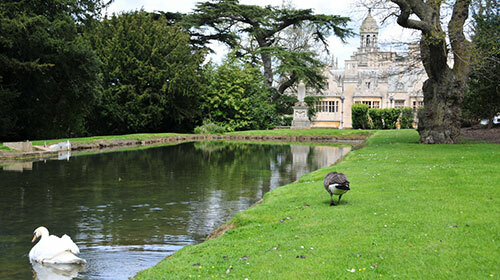 Harlaxton Manor is surrounded by 297 acres of beautiful gardens, parkland, woodland and farmland.